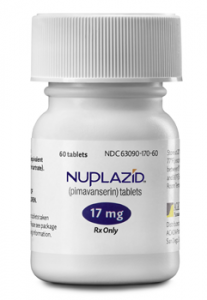 Nuplazid (pimavanserin) is an anti-psychotic drug manufactured by Acadia Pharmaceuticals that is approved for use in the treatment of debilitating and frightening psychosis in Parkinson’s patients. The drug was approved by a process that allows a pharmaceutical review of safety to be expedited by designating it a “breakthrough therapy.” This classification, which was created by Congress in 2012 in an effort to speed up the FDA approval process, means that the drug demonstrated “substantial improvement” in patients with serious or life-threatening diseases when compared to treatments already available on the market. An advisory committee of FDA representatives is required to determine if a drug’s potential benefits outweigh its potential risks. Based on a six-week study of approximately 200 patients, the FDA advisory committee tasked with evaluating Nuplazid voted 12-2 to approve the drug for the treatment of Parkinson’s related psychosis. Of particular concern is that three previous studies of Nuplazid showed that the drug was not effective for this treatment, while still showing similar risks. Some of the committee members that voted to approve the drug also voiced serious concerns about the safety of the drug and it’s expedited approval without additional observational studies. Despite the associated risks, caregivers and family members were anxious to start this new therapy. Nuplazid hit the market in 2016 and racked up over $125 million in sales in 2017. Unfortunately for many of the patients that tried Nuplazid, the effectiveness of the drug was sorely lacking. In some cases, caregivers reported a drastic and sudden worsening of the psychosis symptoms the drug was designed to treat. More frightening were the numerous reports of “adverse events” from patients, physicians and caregivers. These adverse events included deaths, life-threatening incidents, falls, insomnia, nausea and fatigue. The Institute for Safe Medication Practices, a nonprofit health care organization, warned that 244 deaths had been reported to the FDA between the drug’s launch and March 2017, also noting the hundreds of additional reports stating that Nuplazid was “not providing the expected benefit” and in some cases worsening the condition. The FDA’s most recent data shows that the number of reported deaths has now risen to more than 700. Acadia and the FDA continue to maintain that the potential benefits of Nuplazid outweigh its risks. According to the FDA, approximately one million Americans suffer from Parkinson’s disease and up to half of those patients experience significant psychosis, and Nuplazid is the first drug to be approved to treat this specific condition. Nuplazid currently costs around $100 per day. That means a single patient could pay more than $30,000 per year for the treatment, depending on insurance coverage. Acadia expects sales of Nuplazid to double this year. Acadia is currently beginning clinical trials in hopes of getting Nuplazid approved for a larger pool of patients: those who have dementia-related psychosis. The FDA has already granted the highly-coveted “breakthrough” designation for this use as well in hopes of a quick review process. “That is something they should absolutely not do given these unanswered questions about risk,” said Zuckerman. What should Nuplazid patients do? If you or a loved one has taken Nuplazid for Parkinson’s related psychosis and experienced any of the adverse reactions listed above, please contact our attorneys today. We are currently investigating the use of Nuplazid and its connections to the reports of adverse events.